Over the break I dedicated a good chunk of time to the boat project. I didn’t work on it as much as I had planned (traveled to N.C., played with our new Wii, went to Medieval Times, and whatnot), but I’d say I probably put 30 hours of time into it. Here’s an update on my progress. 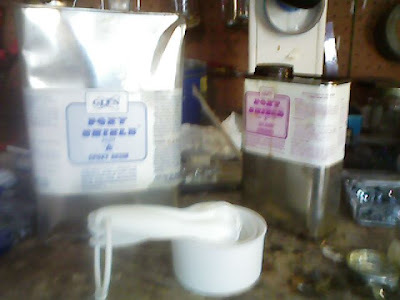 I positioned it with the tail-end outside the garage door so that I wouldn’t die from the kerosene fumes. The heater worked incredibly well. 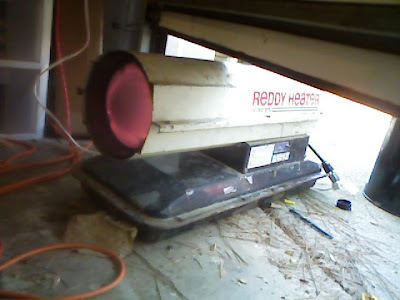 After 30 minutes or so, I’d have to turn it off because the garage became too toasty. As for the boat, I completed the shears. 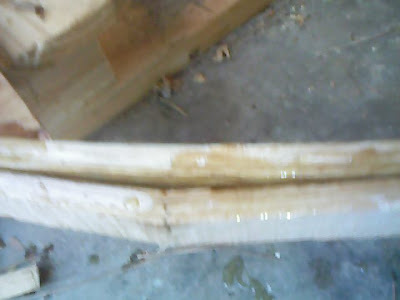 A shear is the piece of wood that runs on the top of the boat from the transom (rear) to the breakhook (point at the front.) 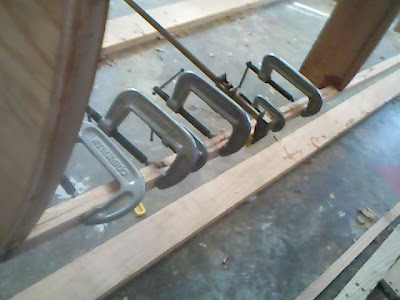 On this boat, the shear must bend a good bit at the tip, so the design calls for two pieces of wood on each side that are skinny enough to be bent individually. This is the first shear on the left side. 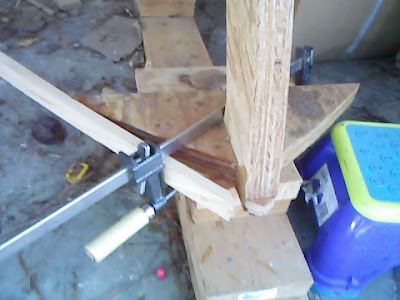 I used two clamps in different places to bend the wood further toward the breasthook. This was a laborious process because I had to go slowly to make sure the wood didn’t break or pop out of the clamp. When I got close to the end, I had to undo the clamps and cut the wood so that it fit into the breasthook a perfect angle. This took a lot of time and usually several different cuts until I got it just right. And I had to repeat this process four times — once for each piece of the shear. At first, I was devastated — figured I’d have to remove the entire 16-foot piece of oak and replace it. But, upon reflection, I decided that I could repair it. 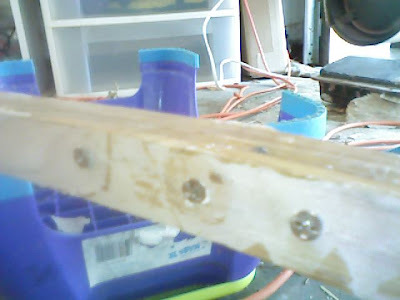 I clamped the wood together, slapped on some more glue and put three screws in from behind to hold it together. If my boat sinks, this’ll be the likely culprit. I had a lot of other troubles. Most often I would move two steps forward and one step back. A simple process like putting a screw into the shear to connect it to side of the boat could often take an hour. The screws are all made of brass — I’m sure there’s a reason for this (exposure to water or something), but the end result is that my power screwdriver often rounds out the tops of the screw. The guy at the Home Depot’s other great suggestion was to first put in a steel screw to pave the way and then use the brass screw. 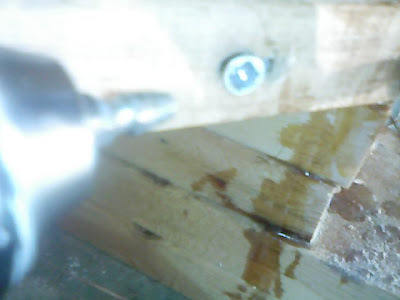 Of course, I’d have to drill a pilot hole first and this would sometimes (OK, eight times exactly) result in my drill bit breaking off in the wood. Then, I’d have to drill another hole next to the first hole and start over. Then, I’d drill using a counter-sink bit to carve out the area for the head of the screw. Then I’d place the steel screw in. I had to put the last quarter-inch of the two-inch screw in very slowly — often cranking the screwdriver by hand to penetrate the hard wood without rounding out the head. I’d then back out the steel screw and replace it with the brass screw. I’d often still round out one of the screws (oak is a very hard wood) and have to pull the useless screw out using an ingenious device know as the “Grab-It.” In short, putting in one screw is not at all as simple as it sounds. I put about 36 screws into the boat. But, after doing the four, 16-foot pieces of the shear, I became an old pro. Here’s the final bit of the last shear where it attaches to the transom. 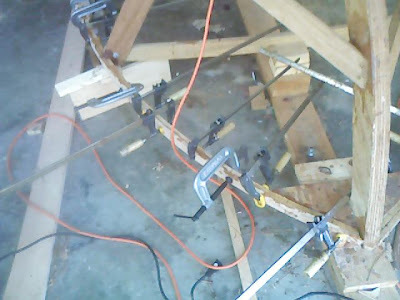 Notice the abundance of clamps. I’m still storing some excess wood on the top right. I’ll need to move that pretty soon. 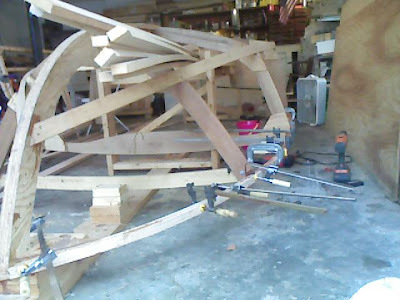 With the completion of the shears, I’ve essentially finished the “skeleton” of the boat. From here on, I’ll be attaching the big pieces of wood to what I’ve already built. It feels like a milestone. 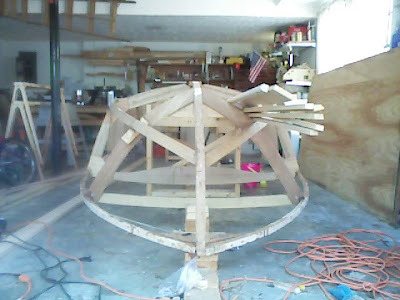 The next part of the process is called “fairing.” I’ll go over the boat and plane off all the corners of the wood so that the plywood can attach firmly to the skeleton. The book describes fairing as the “bugaboo” of amateur boatbuilders. That’s funny because I thought putting on the shears was a bugaboo. So, I look forward with some apprehension to the fairing process. I’m starting school again tomorrow — taking three classes and teaching three classes — so, I don’t anticipate working on the boat again until June. At that time, I’ll offer my gentle readers another boat update.